CONGRATULATIONS to Patrick Shearn and the Poetic Kinetics team for another successful kinetic art piece at the 2015 Coachella Music and Arts Festival. Caterpillar's Longing encompasses two pieces, Papilio Merraculous (the caterpillar), and Desiderium Eruca (the butterfly). Thanks again for bringing me on board for the install and display at Coachella!! Always a blast working together! Congratulations to Oyler Wu Collaborative on their latest addition to 2450 Hyperion. The newly installed canopy, comprised of aluminum tubes and perforated panels, floats effortlessly down from the duplex's second story. At the bottom of the staircase the structure levels and wraps the building's corner terminating in an expressive display of linear structure and curved tube. Installation team positioning final module for attachment. CONGRATULATIONS to Patrick Shearn and the Poetic Kinetics team for once again raising the bar for large-scale interactive, kinetic art at this year's Coachella Music and Arts Festival. The project, Escape Velocity, features a gigantic robotic astronaut with radio-controlled animatronics that articulate it's life-like gestures. The visor is equipped with video projection mapping, allowing for recorded content to be streamed to the audience. This allows participants to interact with the sculpture and have their faces appear on the visor as it traverses the festival grounds. The design and construction of the astronaut required countless hours of tedious work. 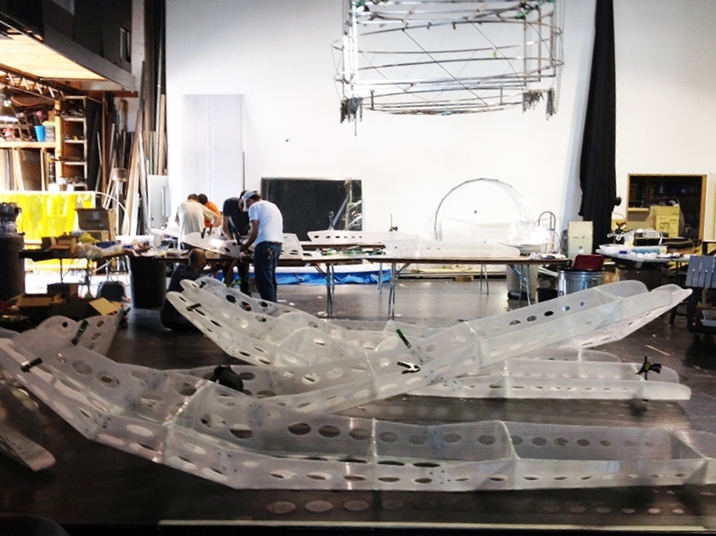 Fabrication and fitting tests were conducted at the Poetic Kinetics parking lot in the DTLA Brewery Arts complex. At the Poetic Kinetics workshop, final adjustments were made to dial in the responsiveness of the forearm and fingers. Aluminum scaffolding was used to keep the sculpture appendages lightweight. 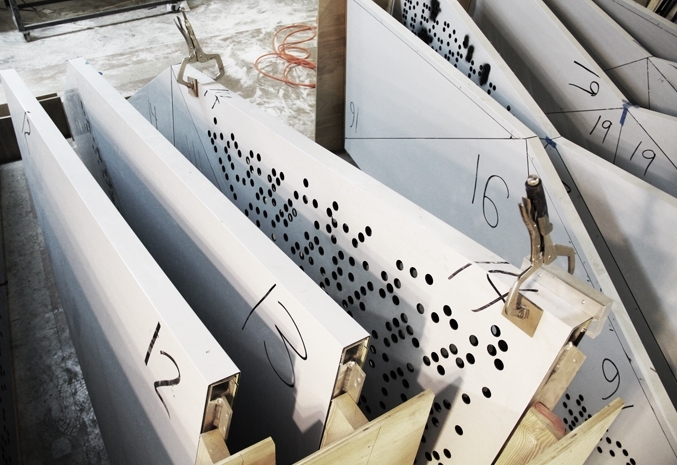 A closer look reveals techniques of digital fabrication to produce the water-jet cut aluminum substructure that comprise the custom hand/finger joint connections. 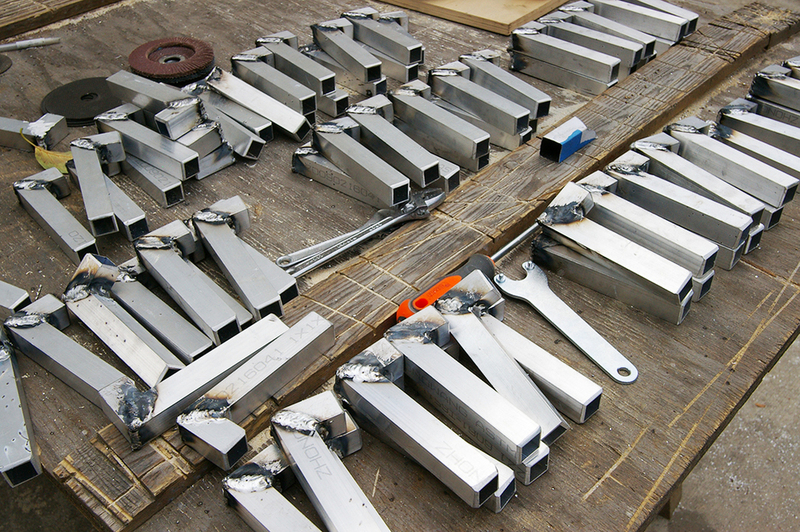 Highly calibrated connection points made for smooth assembly of the piece at the Coachella Music Festival venue. This is a view of the interior framework. Actuators can be seen powering the fingers, wrists, elbows, and shoulders of the sculpture. The astronaut can be found crowd surfing, amplifying the festival experience. Festivalgoers and artists can follow the astronaut's adventures via instagram @CoachellaAstronaut. I feel privileged to have played a part in the debut of this amazing project. Looking forward to more to come. For Google's New York Headquarters main lobby, Situ Fabrication produced twenty-seven, 12' tall, triangulated aluminum wall panels with perforation detail. The wall panels consist of aluminum framing with aluminum composite cladding. The Electric Daisy was designed & built by LA based design group Poetic Kinetics for Insomniac Events and debuted at the 2012 Electric Daisy Carnival in Las Vegas. The sculpture stands 140’ tall at full extension and features 45,000 programmable LEDs. Patrick Shearn, Cynthia Washburn, Neal Everett, Syd Klinge, Juli Gudmundson, AJ Freysteinson, Justin Fortier, Derek Welsh, Bryan Foley, Chris Day, Michael P., DeVon, Vanessa Bonet, Sean Markle, Jacques Lesec, Nathan Meyers, Kristin Samantha Eaton, Avo Soltes, James Peterson. The flower is comprised of ten foot tall water-jet cut coroplast pedals and a steel interior framework. The pedals are reinforced with fiberglass tubing to help withstand the turbulent desert winds. The flower was then mounted to a man-lift to navigate the event field, becoming an interactive visual art piece that embodies the vibrance and overall spirit of the carnival. 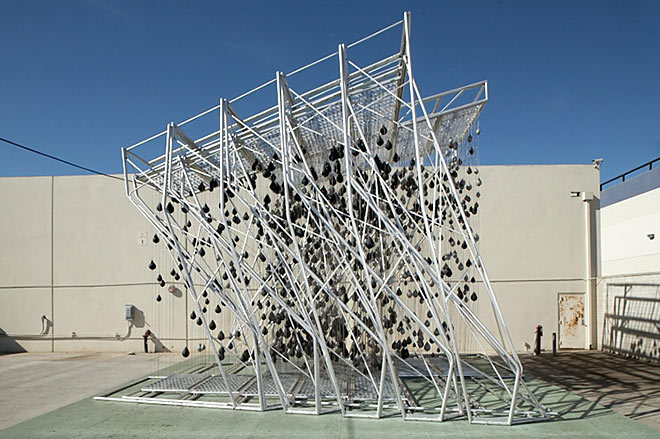 Designed by Oyler Wu Collaborative in partnership with artist Michael Kalish, this traveling installation is built as a tribute to the life and cultural significance of Muhammad Ali. The project is aimed at exposing a new generation to this larger than life character by building an appreciation for the nuanced emotional, aesthetic, and technical principles that collectively form experience - a concept that holds true as much for human persona as it does for architecture. Video documenting the development and fabrication of the 2011 reALIze installation, a tribute to Muhammad Ali, by Oyler Wu Collaborative and Michael Kalish. www.oylerwu.com www.realizeali.com www.themtoo.com Video produced by Them Too Productions. Oyler Wu Collaborative Project Team: Dwayne Oyler, Jenny Wu, Paul Cambon, Chris Eskew, Matt Evans, Ehab Ghali, Jake Henry, Huy Le, Jacques Lesec, Nathan Meyers, Mike Piscitello, Scott Starr, Sanjay Sukie, Vincent Yeh, Han Zhang Michael Kalish Project Team: Michael Kalish, Robert Lepiz Buro Happold Engineers: Matt Melnyk, Eurico Leong Photography: Dwayne Oyler, John Davis, and Buro Happold Engineers. Conceived as an experiential 2D image, the core of the project is a seemingly random field of 1,300 boxing speed bags that, when viewed from a single vantage point, form a pixilated image of the face of Muhammad Ali. The structure is designed with the intention of simultaneously supporting the clarity and focus from that vantage point, while enriching the experience of the piece from all others. Fabrication was conducted in the back lot of M&K metal company located in Gardena, CA by a select team of architectural interns and fabricators. The complete construction and assembly of the twenty-six foot tall wood jig and aluminum structure took several months and countless hours of hand building. Having taken part in the construction of reALIze at its remote location, I was again commissioned to help facilitate the transportation and assemblage of the piece to be showcased to the public. reALIze was on exhibition April 9-23rd at the Los Angeles Convention Center. Built for the Oyler Wu office, this was an aluminum and 100% recycled composite board assemblage. This fence serves as a visual barrier between the busy traffic along Hyperion Avenue and the live/work building. 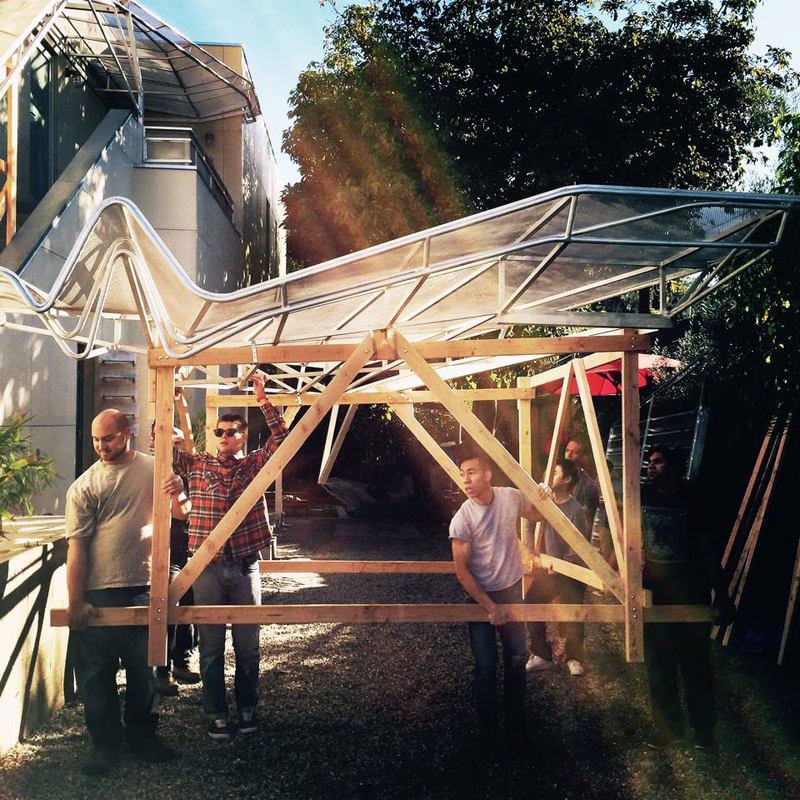 Conceived of as a [not so private] privacy fence, the structure explores the spatial and geometrical implications of a constant fluctuation between horizontal louver and vertical slat.